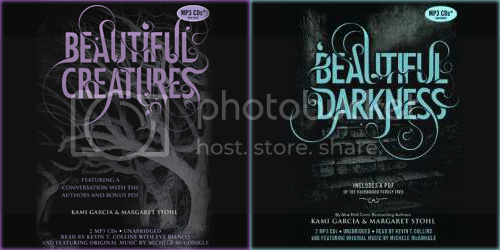 Audio Review: I thought these audiobooks were great! The narrator was easy to listen to, and was really good at creating unique character voices. I also thought that the soundeffects that were in the book were inserted very tastefully (the sound of the incubus ripping through space was so cool!). The only part I wasn't a huge fan of was whenever the song "sixteen/seventeen moons" would play. I thought it sounded corny, and not at all like a real song. Unfortunately, this song plays quite frequently and it always drew me out of the story. BUT, it didn't take long for me to get back in with that awesome narrator. I'm always find it hard to listen to male narrators because they tend to sound old. It makes it hard to believe they are teenagers. I may check this one out at the library though when I need a recap for Beautiful Redemption.